Hong Kong residents might be aware of the Bronze Order of the Bauhinia award, the most commonly handed out medal in the Hong Kong honours system, but now the Bauhinia flower itself has received a bronze gong. 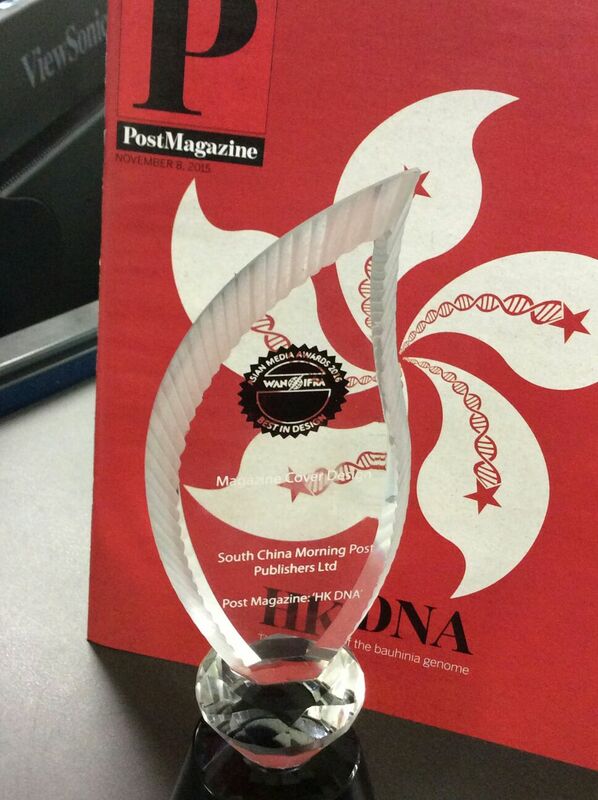 At the at the prestigious WAN-IFRA Asian Media Awards in Manilla last week, the South China Morning Post Magazine cover that featured us in their “HK’s DNA” story picked up the Bronze trophy for Magazine Cover Design. The iconic image that fused the Hong Kong flag with DNA double helices was dreamt up by author of the piece Sarah Lazarus and brilliantly realised by the SCMP graphics director Alberto Lucas Lopez. SCMP had a productive night, winning three awards in the annual competition that pitted newspapers from 19 countries across Asia and the Middle East against each other. The World Association of Newspapers and News Publishers, or WAN-IFRA, has a 70-year history promoting best practices in the publishing industry, and celebrating excellence around the globe in these award ceremonies. Congratulations to Sarah, Alberto and SCMP for the much deserved prize.